via Beirut car bomb explosion caught on CCTV – video | World news | guardian.co.uk. Violence breaks out at the funeral of assassinated top intelligence chief Wissam al-Hassan as protesters call for PM’s resignation. Channel 4 News reports on why his death has caused so much upheaval. Mourners had gathered in Beirut’s central Martyrs’ Square district [photo below] when hundreds of protestors broke away and attempted to storm the offices of Lebanese Prime Minister Najib Mikati at the Grand Serail, writes Dalila Mahdawi from Beirut. Soldiers fired bullets into the air and used tear gas in an effort to disperse the mob. Gerenal Wissam al-Hassan, who headed the controversial intelligence branch of the internal security forces, was killed along with seven others in a massive car bomb on Friday. He was a strong opponent of the Syrian government and was known for his close ties to the former Prime Minister Rafik Hariri, who was assassinated in 2005, and Hariri’s Future Movement party. His death on Friday, which occurred as many parents were collecting their children from school, has largely been blamed on Syria. Damascus has rejected involvement, calling Hassan’s killing a “cowardly” act. Prime Minister Najib Mikati, who many politicians are demanding resign over the killing, arrived to the funeral to a chorus of angry boos from the crowd of around 3,000 people. Many protestors waved flags in Arabic, English and French calling for Mikati to step down. One read: “Get the Syrian out of the Serail [government],” in reference to the President Michel Sleiman and what many Lebanese see as Mikati’s close links to the Syrian regime. 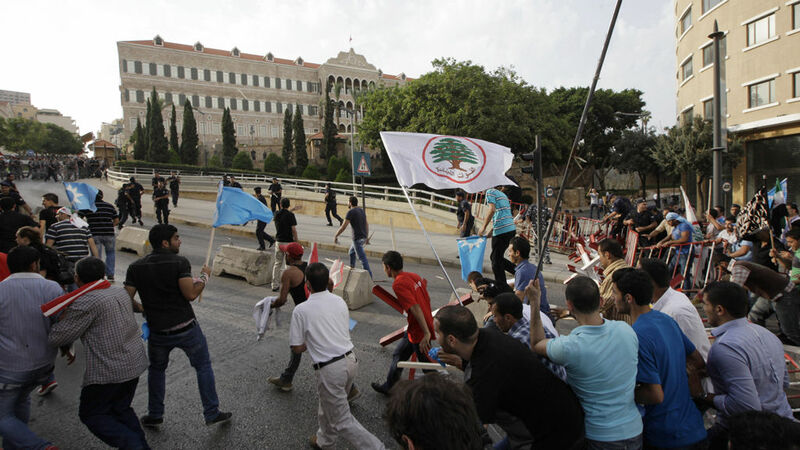 The clashes appeared to have been contained before long, but there are reports that violence has spread across Lebanon, with protestors burning tyres and shooting guns in Tripoli and other areas of Beirut. Dubbed by one local newspaper as “the man who knew too much,” Hassan’s investigations helped the Special Tribunal for Lebanon, the international court tasked with prosecuting Hariri’s assassins and which last year indicted four men with ties to Hezbollah and the Syrian government. Earlier this summer, he had uncovered a plot by former information minister Michel Samaha to commit terrorist attacks against high-profile Lebanese figures. “He was privy to a lot of highly confidential information that was dangerous to many people, so he had to be eliminated,” Karim Makdessi, an associate professor of politics at the American University of Beirut, told Channel 4 News. He was targeted as he passed through a side street off Sassine Square, a busy area in Beirut’s Christian neighborhood of Achrafieh. Mikati is part of the dominant March 8 coalition, formed of Hezbollah and its Christian and Muslim allies and backed by Syria and Iran. He tendered his resignation on Saturday but President Michel Sleiman rejected the move, saying his departure would lead the country into further crisis. Professor Makdessi told Channel 4 News that the opposition March 14 bloc would now try to cash in on popular anger at Hassan’s assassination in order to reassert their weakened position in government. March 14, a coalition of pro-Western Christian and Muslim parties led by the Future Movement, has played a muted role in Lebanese politics in recent years. “Now is the time for mourning and for coming together to create a proper national security and political agenda for the whole country. It is not the time to point fingers or to assert parochial, sectarian agendas,” said Professor Makdissi. But many see Hassan’s assassination as the beginning of a renewed campaign against anti-Syrian figures. Between 2005 and 2008, there were 11 assassinations or attempted assassinations in Lebanon. 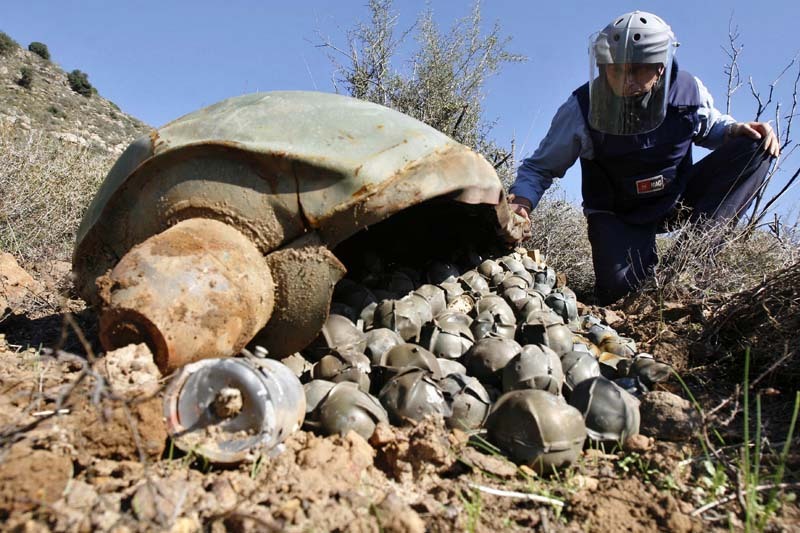 All of the targets were politicians or journalists vocally opposed to the Syrian regime of Bashar al-Assad. Simon Haddad, a Lebanese political analyst, said that while a number of other senior Lebanese officials were now possible assassination targets, it was more likely that the diplomatic repercussions of Hassan’s death would play out in Syria. (Reuters) – A huge car bomb exploded in a street in central Beirut during rush hour on Friday, killing at least two people and wounding 46, witnesses and security sources said. It was not immediately clear if the explosion targeted any political figure in Lebanon’s divided community but it occurred at a time of heightened tension between Lebanese factions on opposite sides of the Syria conflict. The bomb exploded in the street where the office of the anti-Assad Christian Phalange Party is located. Ambulances rushed to the scene of the blast near Sassine Square in Ashafriyeh, a mostly Christian area, as smoke rose from the area. It occurred during rush hour, when many parents were picking up children from school. The security source confirmed two dead. At least 46 people were wounded, another security source said. Several cars were destroyed by the explosion and the front of a multi-storey building was badly damaged, with tangled wires and metal railings crashing to the ground. Residents ran about in panic looking for relatives while others helped carry the wounded to ambulances. Security forces blanketed the area. The war in neighboring Syria, which has killed 30,000 people so far, has pitted mostly Sunni insurgents against President Bashar al-Assad, who is from the Alawite sect linked to Shi’ite Islam. Tension between Sunnis and Shi’ites has been rumbling in Lebanon ever since the end of the 1975-1990 civil war but reignited after the Syria conflict erupted. It reached its peak when former Prime Minister Rafik al-Hariri, a Sunni, was killed in 2005. Hariri supporters accused Syria and then Hezbollah of killing him – a charge they both deny. An international tribunal accused several Hezbollah members of involvement in the murder. Hezbollah’s political opponents, who have for months accused it of aiding Assad’s forces – have warned that its involvement in Syria could ignite sectarian tension of the civil war. The last bombing in Beirut was in 2008 when three people were killed in an explosion which damaged a U.S. diplomatic car. However fighting had broken out this year between supporters and opponents of Assad in the northern city of Tripoli.